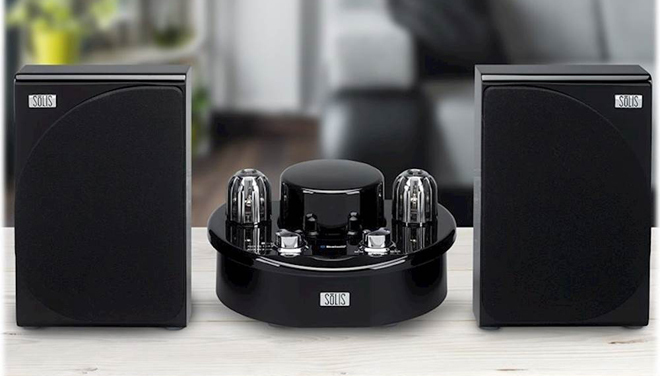 Overview – Geared toward users who want a little something different out of their wireless audio system, the Solis SO-7500 is a modern stereo Bluetooth speaker solution with a splash of old school tech thanks to a stylish vacuum tube/solid state hybrid amplifier. And while the merits of such an amp might not be as pronounced on a model in this class, the system offers a rich, warm sound with wireless and wired sources. Also, it just looks plain cool. With that said, I did run into some isolated issues with an initial set of defective speakers, and though Solis was quick to send over a replacement unit that fared much better, I still have some minor concerns that hold back a full recommendation. But even with that caveat out of the way, this remains a unique and undeniably classy bookshelf speaker option. Though they're now mostly relegated to higher-end audiophile gear from premium brands, vacuum tube amps used to be the norm before modern transistor/solid state tech took over the market. And there are still many who swear by their design, extolling the pleasingly round and warmer tonal quality they're purported to provide. But while the real benefits of vacuum tubes are likely most evident in larger, more expensive products, that doesn't mean the tech can't help spruce up a smaller bookshelf system. Case in point: The Solis SO-7500, a Bluetooth stereo speaker solution with wireless and wired connectivity powered by a compact vacuum tube/solid state hybrid amplifier that aims to deliver a bit more than just an extra dash of style. 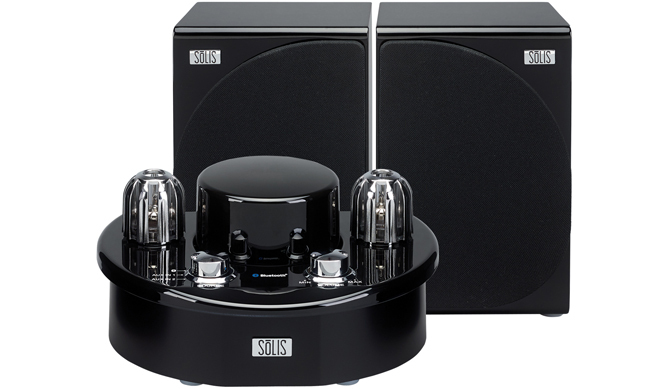 The Solis SO-7500 system includes two 20W bookshelf speakers and a compact vacuum tube/solid state hybrid amplifier. The speakers each use a 3.5-inch polymer cone woofer in a bass reflex (ported) enclosure and a 1.25-inch soft dome polymer tweeter, along with a removable fabric grille. Meanwhile, the amp pumps out 12W rms x 2 @THD10% at 1kHz per channel and uses two preamp 12XA7 vacuum tubes rated for 5,000 hours of use along with a toroid transformer power supply. Finally, two 6' speaker cables with banana plugs and one 6' stereo line-level RCA cable are included as well. The speakers and amp both feature a stylish piano black glossy finish. The tubes themselves glow a faint orange when in use, giving the system some eye-catching flare. Silver dials are included on the amp for volume and source selection while left/right speaker terminals, two AUX-in RCA jacks, and a power connection are situated on the back. The Solis logo also adorns all three components, but the badge was slightly slanted on the amp I received for review. Not a big deal, of course, but still a little bothersome for a device that screams premium aesthetics in every other way. Playing up the premium aesthetics of the vacuum tube design, Solis has actually included a pair of cotton white gloves and a small brush in the box for proper unpacking and upkeep of the system -- ensuring that pesky fingerprints won't blemish that glossy black finish. Sure, it might be a little unnecessary, but it's still a nice touch that adds to the audiophile feel of the unit. With gloves slipped on, all one has to do is plug in the included power cable, connect the speaker wires to the amp, and connect any external RCA sources. Once the unit is powered, customers simply need to turn the dial to the desired source. After selecting Bluetooth, I was able to instantly locate the system on my Galaxy S7 smartphone and wirelessly connect with no issues whatsoever. Likewise, the system is able to maintain a Bluetooth connection even if you decide to switch the dial to a wired source, making alternating between the two a breeze. Really, the only thing missing when it comes to connectivity is Wi-Fi support for true hi-res wireless playback. 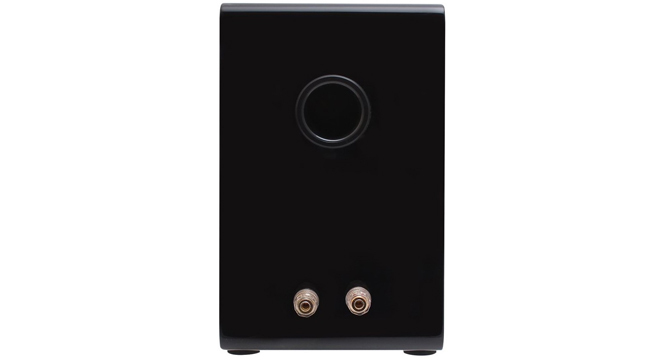 And though the speakers and amp are designed to be used together, unlike some other wireless Bluetooth systems, there's nothing proprietary about the connections -- meaning users can opt to use a different set of speakers, so long as they are 4 – 8 ohms and have a power rating of 20W (rms) or higher. To test out the Solis S0-7500 system, I listened to a wide assortment of music tracks in a variety of formats from several different sources, including streaming services like Spotify and Tidal over Bluetooth and a wired connection, MP3 and FLAC files over Bluetooth and a wired connection, and several CDs through a wired connection. Bluetooth tracks were played from a Samsung Galaxy S7 smartphone while all wired content was played from a desktop PC drive. And with the exception of one notable caveat (more on that below), performance was genuinely impressive across the board, offering a pleasingly rich and clean sound with almost all of the material I sampled, including tracks from an eclectic assortment of artists like Michael Jackson, Gnarls Barkley, Arianna Grande, The Eagles, Daft Punk, AC/DC, Arcade Fire, and more. The smooth pop beats off of Michael Jackson's Dangerous album carried a velvety depth and warm texture, revealing clean separation between the high-mids in vocals and lower tones. Meanwhile, AC/DC's "Back in Black" and Gnarls Barkley's "Crazy" both came through with some nice kick, providing solid low-end presence considering the system's lack of a dedicated subwoofer. And Arianna Grande's "Focus" brought everything together with a well-balanced range of frequencies, avoiding the cluttered sound that some similarly sized bookshelf systems can present. Wired hi-res and CD playback offered a slight edge over Bluetooth streaming, but the amp's wireless performance was surprisingly strong. In fact, after volume matching both sources, switching between the same track on wired and Bluetooth inputs often produced only negligible differences. Of course, without a separate subwoofer the low-end could feel a bit muted at times and though the vacuum tube amp did seem to add a sense of warmth to the system's range, the speaker's tended to favor lower mids at the expense of some crispness in the highs. Still, from pop music to heavy metal anthems and jazz instrumentals, overall sonics were quite inviting and though far from a powerhouse, the unit offers enough volume for small to mid-sized rooms. Now that we've covered all the basics, it's time to address that pesky caveat I mentioned earlier. After listening to my initial review system for a few days, I started to hear some odd distortion on a few isolated tracks (whether Bluetooth streaming or during hi-res wired playback) -- particularly Radiohead's "Codex" and "Life in a Glasshouse," Norah Jones' "Sunrise," AC/DC's "Hells Bells," and Sufjan Stevens' "Mystery of Love" from the Call Me by Your Name soundtrack. To be clear, these songs presented no such problems on two other speaker systems I tested so the issue was not source-related. At first I thought I might just be hearing the speakers vibrating against the surface they were on during certain lower frequencies, but the problem would still persist even when I placed towels underneath the units or held them in my hand, making it clear that there was some kind of harsh vibration/distortion occurring within the cabinets. Sadly, lowering the volume didn't really alleviate the problem either and the speakers still demonstrated the issue when connected to another amp. With that in mind, I contacted Solis and they promptly shipped a new set of speakers. Thankfully, the replacement units were virtually problem-free and the distortion was now completely absent from all of the previously affected tracks -- that is, with the exception of "Sunrise" and "Mystery of Love." Though much better than before, I could still detect just a hint of distortion during lower frequency cues on both songs. To be honest, if my ears weren't already trained to listen for the problem I don't think I would have noticed it again -- but the fact that the replacement units were not completely free from the issue gives me some pause, making me fear that extended use might start to aggravate the drivers and make it worse. I do want to be clear, however, that this problem only occurred during two songs with the replacement speakers and was barely noticeable. All of the other tracks I listened to, including many with deeper low-end activity, sounded great with no issues to report. I'm not sure what it is about those two songs that makes them tricky for this particular system, but they seem to be the exception rather than the rule. Adding a dash of old-school tech and style to a contemporary wireless music system, the Solis SO-7500 Bluetooth Vacuum Tube System is just plain cool. Though the hybrid amp might be a little gimmicky for a system in this power and price range, the resulting sound does seem to benefit from a little added warmth and, if nothing else, the premium design makes it stand out against an increasingly crowded wireless speaker market. Unfortunately, I did run into some distortion issues with my initial, apparently defective speakers, and though the replacement units were virtually problem-free, I can't help but harbor some concerns about the drivers' long-term stability. At the end of the day, overall performance was still very strong, however, so while I'm a bit hesitant to give a full recommendation, the SO-7500 is an undeniably unique and elegant Bluetooth speaker solution. Worth a look for music lovers who want a modern bookshelf speaker system with a little extra splash of retro flair.